Most of us enjoy a quick blast from a power shower or a long and indulgent soak and probably cannot live without a shower! Luckily there is a wide range of electric, power, digital and mixer showers on the site at affordable prices. There are competitive offers on brands such as Mira, Triton, Trevi and Aqualisa. Suppliers include Asda, Argos, Focus, John Lewis and Tesco. 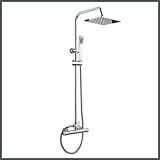 Mira Elate 9.8KW Electric Shower.